The Kakatiyas were members of the Durjaya clan, who initially started as vassals of the Chalukyas in India, and later emerged as a ruling dynasty, reigning in the region of Telangana, with their capital at Kakatipura (probably named after the village diety, Kakatamma) or present day Warangal, in the state of Andhra Pradesh. They were said to originate from Chaturthakula and they allied themselves by matrimony to chiefs of the Shudra caste, although in many documents related to gifts given in the Brahmins, their ancestry has been traced to the Solar dynasty of the Ikshvaku kshatriyas. 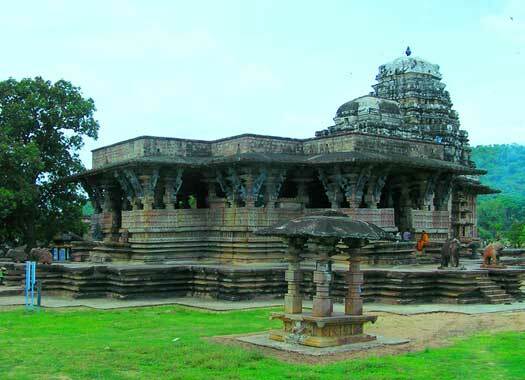 The Kakatiyas are known through their famous architecture such as Fort Warangal, the Ramappa Temple, the Thousand Pillar Temple, and so on. Founder of the Kakatiya line. Mentioned in Bayyaram inscription. Son. Rashtrakuta vassal. Died about AD 900. Gunda III dies fighting for his overlord, the Rashtrakuta king Krishna II, against the Eastern Chalukyas. His son Erra is given the land of Kurravadi near Warangal in repayment for the services of his father. Son. Rashtrakuta vassal. Ruled from Kakatipura. Son. Rashtrakuta vassal. Mentioned in the Mangalu grant. Gunda IV supplies help to Danarnava on behalf of his master, Krishna III, to help him set aside his brother, the Eastern Chalukyan king, Amma II, and occupy the throne of Vengi. As a result, Gunda is gifted with Natavadi / Manigallu as a token of gratitude. Garuda is a great warrior who probably joins the Western Chalukya armies of Someswara I in the Chola invasion of 1052. Along with his general, Recharla Bramha, he destroys the Chola armies (of King Rajadhiraja I) and enters the city of Kanchi. He later kills the warriors Anuma and Konda who ruled over their capital Anumakunda or Hanumakonda. Prola subdues enemy chiefs (from Chakrakuta Bhadranga Purukuta in Bastar to Konkana Mandala) for his overlord Someswara I and his son Vikramaditya VI. For his services he receives Hanumanakonda. Prolla II is responsible for subduing the Telugu Cholas of Kandur, eliminating Govindaraja, Udaya and Jagdeva and Gunda (the ruler of Mantrakuta), and seizing Manthena on the Godavari. He declares his independence from the Western Chalukya king, Tailapa, but dies fighting after the invasion of Vengi in 1150 with a confederacy comprising the Kotas of Amravati, the Haihaiyas of Konamandala, and the Malaya chiefs. An ambitious king, Rudradeva extends the boundaries of his kingdom: in the north (taking in modern day Karmnagar, and East Godavari); in the south (where he turns his attention to the Kondur Telugu Chola kings Bhima and Chodur in Nalagonda and Mahboobnagar, sacking their cities, Vardhamana and Kandur); and in the east (the Chalukya Chola regions of king Rajaraja III). The Palanadu chiefs fight amongst themselves, so Rudradeva renders military assistance to Nalagama's faction. The military strength of Velanadu has been weakened, so Rudradeva exploits the situation by leading his forces into coastal Andhra and conquering territory as far as Srisailam and Tripurantakam in the south (subduing the chiefs of Kota and Kondapadumatis). Rudradeva extends his kingdom to the coastal regions of the Cholas after the death of Kulotunga. Rudradeva dies fighting the Seuna Yadava king Jaitrapala I. His successor, Mahadeva, dies the same way. Ganpatideva is captured and imprisoned by the Seuna Yadavas. He is later set free due to political considerations. Rebellions arise in the kingdom but these are crushed by the Kakatiya general, Recherla Rudra, and Ganpatideva later brings the entire Telugu Pradesh under one rule by subduing the Cholas, the Velanadu chieftains, and the Ayya chieftains, amongst others. Having no sons, Ganpatideva hands over the reigns of his kingdom to his daughter, Rudramadevi. Daughter. m to Eastern Chalukyan prince Virbhadra. The queen dies fighting the Kayastha chief, Ambadeva. Prataparudra suppresses internal and external challenges and expands his kingdom westwards. He wards off the first attack by Malik Kafur in 1303, during the Islamic conquest of India which is centred on the Delhi sultanate, but the second attack of 1309 sees Malik Kafur capture Siripur and Hanumakonda, and the kingdom ravaged, forcing Prataprudra to sue for peace. Prataprudra reasserts his independence as the Khilji dynasty ends and the Tughlaqs come to power in Delhi. In 1323, Sultan Ghiyasuddin Tughlaq sends his son, Ulugh Khan, to defeat the defiant Kakatiya king. The attack is repulsed but the Tughlaqs return a month later with a larger and more determined army. The unprepared and battle-weary Kakatiya army at Warangal is finally defeated, and Prataparudra is taken prisoner. It is said that he commits suicide by drowning himself in the River Narmada, while on his way to Delhi. With Prataprudra's demise, Kakatiya rule comes to an end. Later, the Musunuri Nayaks who had served as army chiefs for the Kakatiya kingdom, unite the Telugu people and recover Warangal from Delhi. They rule the region for half a century. Prataprudra's brother, Annamdev, sets up his own kingdom at Bastar, Chattisgad.